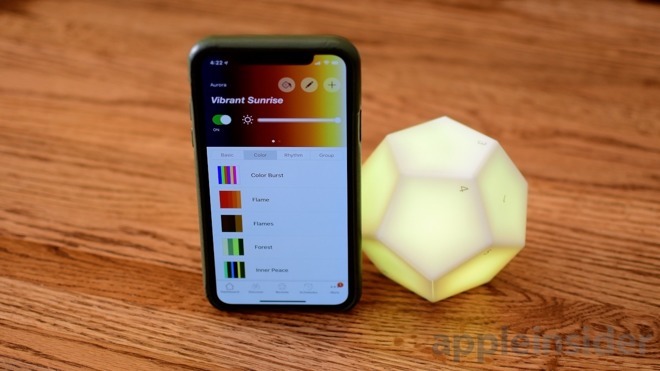 Nanoleaf Remote is a twelve-sided controller that lights up and vibrates as you control your HomeKit accessories, like adjusting the lightscape on your Aurora LED panels or locking your doors. 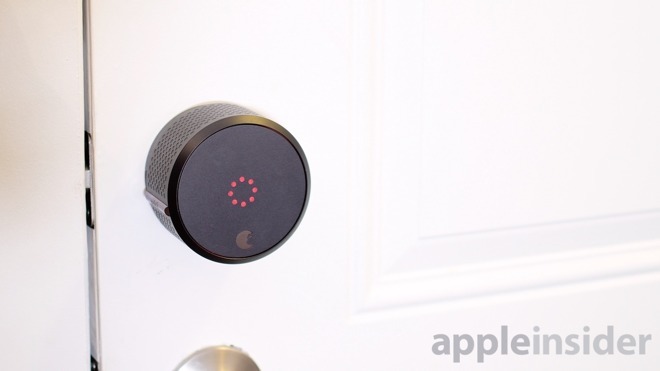 AppleInsider has had it for a while —is it worth adding to your HomeKit suite of accessories? See how the Remote works for yourself in our hands-on video. 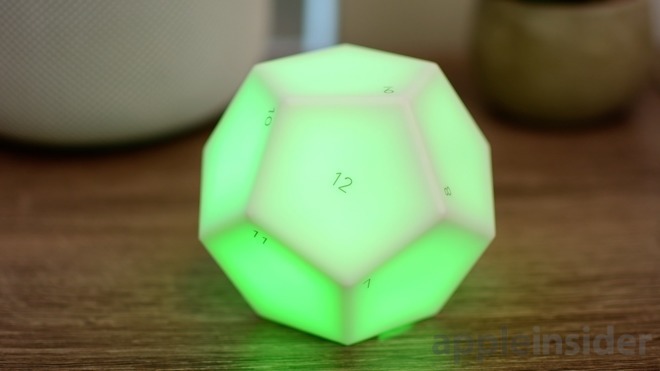 Nanoleaf took an interesting route with their dodecahedron-shaped remote. Instead of three-four button interactions found on every other HomeKit controller, the Nanoleaf Remote opts for twelve. Even more, if you take it to the next level with complicated conditional programming. The Nanoleaf Remote not only works exceptionally well with their own LED lighting panels but any HomeKit accessory. This opens it up to a slightly larger market with some very neat functionality. The basic gist is that a dedicated scene can be assigned to each side of the remote. Whichever numbered side is face up corresponds to scene that will be enabled. There are some small facets beyond just this that complete the experience, but that summarizes it in a nutshell. 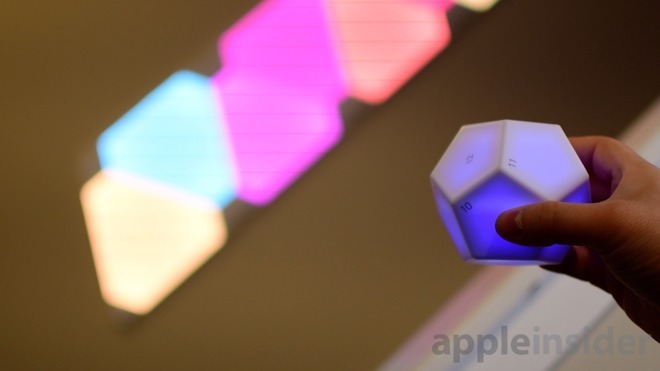 As we mention at the inset, the Nanoleaf Remote is a dodecahedron. When you first open up the box, it will be in two distinct pieces. A larger half will also house the necessary components including the gyroscope, vibration motor, LED lights, and the battery housing. 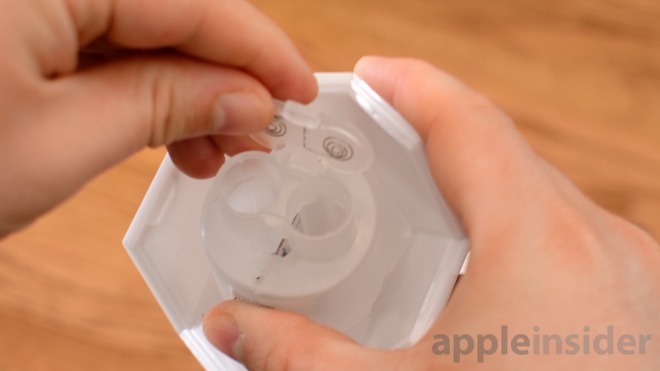 For HomeKit owners, the secure pairing code is also affixed to this internal housing, hidden from view once closed. When the batteries run out, the housing needs to be opened, and we found the method of opening it a bit burdensome. A screwdriver is necessary and seems to even mar the soft plastic shell a bit when wedged apart. This shouldn't happen too frequently, but happens enough we wish there was a better mechanism in place. The shell is largely made of a semi-opaque white plastic, that lets the internal LEDs emit through as different scenes are enabled. It is a nice touch and is kind of fun to play with on its own. We definitely went through quite a bit of battery life testing this out the past few weeks. A great place to start with the Nanoleaf Remote, is the Nanoleaf app. Particularly if you are using the Remote with Nanoleaf's LED tiles. You can create and assign any different lighting design and animation to any of the numbered sides. If you've used any of Nanoleaf's lights before, you will be familiar with the process of creating scenes. Because of limitations with HomeKit, scenes for the LED light panels are best made within the Nanoleaf app. If created here, they can contain animations, transitions, speeds, brightness, multiple colors, and more. When using HomeKit, the Nanoleaf app also allows you to add other accessories and scenes to the sides of the remote, though we found this a bit more streamlined within Apple's own Home app. As with most HomeKit accessories, firmware updates are handled through the native Nanoleaf app. Many people own Nanoleaf's light panels, but even more are just HomeKit users. Luckily, you don't have to own any of Nanoleaf's other products to get use from the remote. 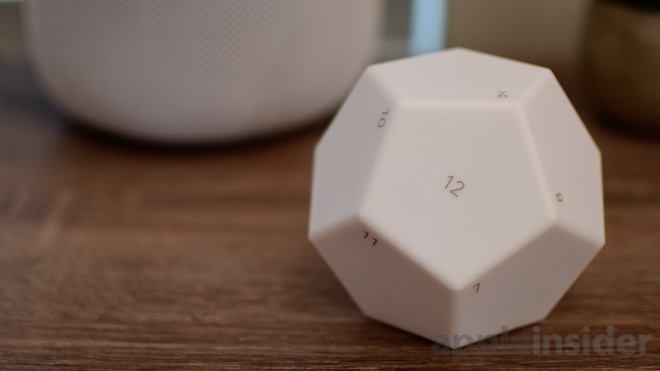 Each of the twelve scenes can include any number of other HomeKit accessories. It doesn't matter what —lights, door locks, thermostats, garage doors, fans, humidifiers, and more. In the living room, each side can be set to a different lighting scenario. Many scenes we have set up include a more blue-tinted light to enhance concentration, warmer-yellow light for mornings and evenings, low lights for movie night, all crazy lights for parties, and of course - off. It is pretty straightforward to set up the Nanoleaf Remote right from the Home app. 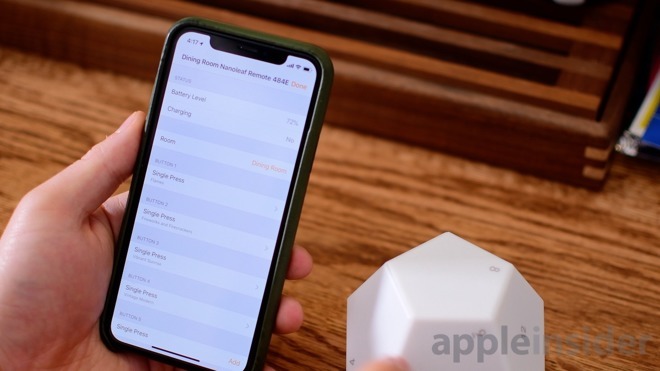 There is a bit of a difference in nomenclature, however, as Nanoleaf refers to this as a "remote", while HomeKit actually sees this as a "button". In the Home app, there are twelve "buttons" each with a "single press" corresponding to them. Each "press" is nothing more than the trigger when the number is rotated to the top. For those who want to get complicated, conditionals can be set up using other third-party HomeKit apps. Elgato's Eve app is particularly skilled at this. Conditionals allow you to get more granular with your controls, performing different things based on different conditions. One of the most common use cases of conditionals is to use them to "toggle" scenes on and off. As an example, if we rotate our Remote to eight, the conditional will check if the lights are on or off. If they are off, then our living room lights turn on. If we move the remote for a moment but place it once more with eight facing up, it will trigger the same scene and the conditional will check to see that the lights are on, but now turn them off instead. If a toggle conditional was set up for each of the twelve sides, it effectively doubles the number of commands available to the Nanoleaf Remote. Using the Nanoleaf Remote is pretty easy - assuming you can remember what each side does. In real-world use, we found ourselves mostly sticking with just a few basic scenes, leaving the bulk of the sides largely unused. When we wanted to set a scene, we just rotated the remote til we found the number we were looking for. The remote intelligently won't trigger a scene until a beat or so after a side is placed face up, giving users a chance to rotate it around a bit looking for the correct side. A soft glow comes from the inside of the Remote, with each side getting its own color. This can be a nice visual demarcation of which scene was set, especially if you can't see the numbers. Once a scene does lock-in, a quick vibration can be felt, providing some much needed haptic feedback. Nanoleaf's Remote shines best when used with their own light panels. With so many different lightscapes that can be programmed, it is a great way to cycle between many of them without requiring a phone. We set up eleven of our favorites, then one as an "off" state, and regularly used that to control our lighting. Currently, there are several other HomeKit buttons out there on the market. We've seen the Elgato Eve Button (review), Logitech POP, Fibaro's The Button (review), Hue Tap, and the Hue Dimmer. Each of these is limited to only three commands, other than the pair of Hue products which each get four. Users that are looking for more expandability may be tempted by what the Nanoleaf Remote has to offer. Nanoleaf also has the other nuances the others don't. We love the subtle lighting effects that glow as the remote is used. We're also fans of the haptic feedback that is triggered whenever a scene is set. In reality, most users aren't going to remember a dozen different scenes. However, when the price is similar to all the other buttons that do the same thing to a lesser extent, plus you have the additional effects and the "coolness" factor, it really gives the Nanoleaf Remote the edge. When we got our first look at the Nanoleaf Remote out at CES earlier this year, we were instantly taken. No other remote has anything near the same appearance, which can be quite polarizing. Surely some won't be as in love with the dodecahedron shape as we are, and it won't seamlessly blend into some more traditional-looking interiors. Also goes without saying that if someone is looking to mount their controller onto a wall the Nanoleaf Remote is not the right option. Fortunately for us, we love this sitting right out in the open. We've been steadfast believers that any smart home still needs physical controls. While the Nanoleaf Remote isn't a "button" in the obvious sense, it serves the same purpose with a bit of flair. 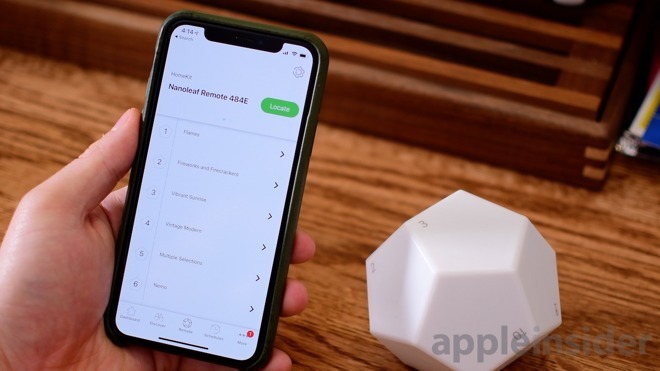 Those looking to pick up one of the Nanoleaf Remotes can find it in Apple Stores, or directly from Nanoleaf for $49.99.